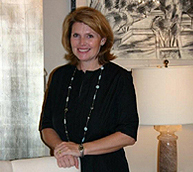 Teri Thomas has been designing tasteful and sophisticated interiors for over 25 years. With the integration of architectural and interior design, the homes on which she has worked have a cohesive and comfortable flow throughout. From start to finish, all aspects of the design process combine to achieve a refined use of materials and strong silhouettes. As a designer, Teri values the harmony of the design project and the lifestyle of the client. Whether contemporary, traditional or transitional in feel, each project is a reflection of the unique elements which combine for a timeless environment. Teri Thomas has designed homes and offices through the southeastern United States as well as such destinations as Sun Valley Idaho, New York, and Pennsylvania. From urban spaces to elegant homes, from mountain retreats to beach cottages, the versatility of her projects has made for a creative and diverse career.